Cataracts is a disease of the eye that results in the clouding of the crystalline lens in the eyeball. 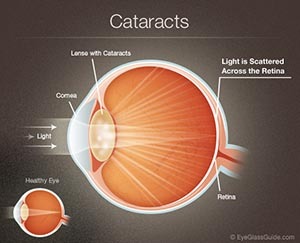 Cataracts prevent clear images from appearing on the eye’s retina; causing mild, moderate, even severe blurred vision. During your eye health evaluation, we will carefully examine your lens for signs of cataract formation. If a cataract is noticed and the clouding is causing visual disruption, the optometrist will refer you to a trusted and respected Ophthalmologist for surgery, which is the only known cure for cataracts. Duvall Advanced Family EyeCare provides pre and post cataract surgery care right here in our Duvall eye care clinic. Following surgical removal of the natural lens, an artificial intraocular lens (IOL) implant is inserted (eye surgeons say that the lens is “implanted”). Cataract surgery is generally performed by an Ophthalmologist (eye surgeon) in an out-patient setting, in a surgical center or hospital, using local anesthesia, usually causing little or no discomfort to the patient. Well over 90% of operations are successful in restoring useful vision, with a low complication rate. Day care, high volume, minimally invasive, small incision phacoemulsification with quick post-op recovery has become the standard of care in cataract surgery all over the world.